(1756/7–1822) who was an English painter, illustrator and etcher of animals, hunting, horse-racing and landscape scenes. Reverse with sportsman at the edge of a reed bed. Inscription on the front of the jug. 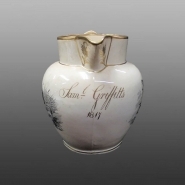 Perhaps the name should read Saml Griffiths as Griffitts is an unusual surname rarely found. 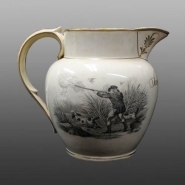 Bone china jug with black prints of English sporting scenes. On one side is a huntsman dismounted and leaning on his horse surrounded by his pack of hounds. On the reverse is a huntsman accompanied by two dogs, he is in a reed bed and shooting at a bird taking flight. There are gilt painted bands at the rim and handle and a leaf design painted in gold on the spout, beneath which is the gilt inscription Saml Griffits 1817. The sources of the printed designs have not been identified but are reminiscent of the work of Samuel Howitt (1756/7–1822) who was an English painter, illustrator and etcher of animals, hunting, horse-racing and landscape scenes.